It’s difficult not to be impressed with a casino that offers over 1000 games, a top quality user friendly website that is jam packed with content, and state of the art player safety and responsible gambling capabilities. What’s more, all of this is delivered with humour and pizzazz – even the loading screens are amusing. 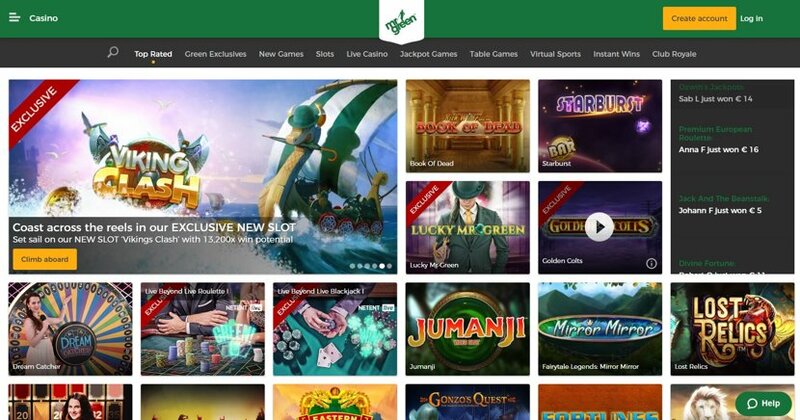 Mr Green might not be the only online casino with an elusive and enigmatic gent as it’s figurehead (are those antlers we can see in the distance?) but it sets itself apart in so many other ways. Born from the minds of three Swedish iGaming entrepreneurs, Mr Green has developed working relationships with scores of providers big and small, making this a fantastic choice for those that like to discover new slots and lesser known developers, and Live players will be equally impressed with a truly in depth and immersive Live Casino experience. 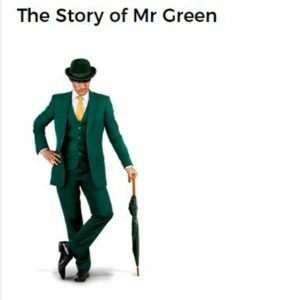 There are Mr Green exclusives in both categories too, including two slot games featuring the suited and booted gentleman himself. There is a reason the casino has won so many awards, including the coveted Online Casino Operator of the Year at the IGA’s three years running from 2013-2015; and both the Mobile and Gaming Operator of the Year the two years after that. In truth, it’s hard to find fault with Mr Green, but since we are super diligent we did manage to find one or two for you. Keep reading to find out more. Mr Green have, somehow, managed to create an interface that is overwhelmingly stacked with options, but never a chore to use. All of the fun stuff is channelled into the main task bar (Casino, Live Casino, Sportsbook etc) and the corresponding sub task bar (Slots, Table Games, Instant win etc when in the Casino); while the more practical options such as the FAQ, About Us and T’s & C’s are tucked away nicely under the Menu button; easy to find but not in the way. Useful quick links to your account info, Banking and Alerts stick at the top of the page. The site is powered by Microgaming software and there is nothing to download, while the games come from far and wide and in huge numbers too. There are around 900 Slots for a start, from top software developers like Netent, Microgaming, IGT, Playtech, Play’N GO, Yggsdrasil – the list goes on; but Mr Green also gives plenty of smaller providers a crack at the whip, Elk Studios and Red Tiger to name just two. While it’s great that the site is stuffed with so much game diversity, it’s not possible to categorise them further, and it would take you all day to scroll through the lot. You can use the search bar but that’s no good for exploring. The unmistakable branding adorns the graphically heavy site but doesn’t seem to slow it down too much; maybe a step here and there but nothing eye rolling. And although the site is very busy and feature rich it always feels intuitive and easy to navigate, with everything stored in its rightful place. Perhaps they took inspiration from their Swedish friends and clever storage experts, IKEA? Slots – The mother-load. 900 titles will keep you busy until the end of time. Why not try an exclusive like Lucky Mr Green or Mr Green’s Grand Tour? Live Casino – Evolution Gaming and NetEnt fight for dominance in the Live Casino, with more than 50 titles on show. As well as a healthy number of Blackjack and Roulette tables with a pleasing range of table limits, you could also try Football Studio or Dream Catcher. Jackpots – We found a tidy 50 Jackpots with Mega Moolah, Rainbow Jackpots and Andy Capp all making an appearance. Table Games – A total of 33 Table Games consist almost exclusively of Roulette and Blackjack variations. The one exception is Caribbean Stud, leaving Poker fans high and dry. Instant Wins – Diamond Deal and Red Card are two of the 20+ options available here. Grabba Dabba Dough is another and is as fun to say as it is to play. Virtual Sports – Nestled in there for the sports fans, 16 virtual games cover Greyhounds, Trotting, Speedway, Football, Velodrome, Horses, Cycling and Tennis. Reel Thrill – These competitions pit you against your fellow players to win extra’s if you make the leader board. Points are earned on percentage, so a 25p spin that wins £10 is worth more points than a £100 sin that wins £150 – which keeps things fair for all. On a separate note: Mr Green’s website could be used as an instruction manual for online gamers. There is so much detail on every aspect of play available to digest, including how individual game categories tend to work, how to make the most of bonuses, and how the industry works as a whole. If you are a new player this veritable encyclopaedia is absolute gold. Since Mr Green keeps winning Mobile Operator of the Year at the IGA’s you would expect their mobile offering to be top notch, and it is. A good 75% of the games on the desktop site have successfully made it over to the mobile version, the help icon is on hand instantly if you need it, and the layout is reminiscent of the main site too, so you shouldn’t get stuck. We would advise using the search box here though, or else you could spend your whole bus journey trying to find your favourite game. The app doesn’t fair quite as well if you ask us. It’s an altogether different product and the interface is much less user friendly than the mobile site, lacking the style and sophistication found elsewhere. 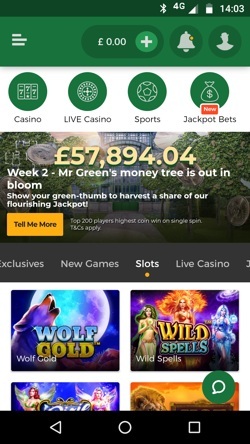 All of Mr Green’s offerings (Sportsbook, Live Games etc) are contained within a single app, but once Casino is selected you are simply shown All Games with nothing but a ‘search’ button to help you. No categorisation or anything. It’s pretty barren and, sadly, we didn’t like it. Focusing on the mobile site, we did have some issues with loading times but they weren’t horrendous, and once it’s happy the site is extremely responsive and flows beautifully. We suspect that all but the most impatient of gamers will find the extra few seconds a small price to pay for such a quality product, and for the rest Mr Green offers some advice on the loading screen: “Patience my young grasshopper”. It was all going so well and then… fee’s. It’s becoming rarer and rarer to see deposit/withdrawal fee’s these days, but sadly, they’re still here. Mr Green will charge you £1 to withdraw up to £100 and 1% up to a maximum of £10 thereafter. Be aware that there is also a 3.9% fee to deposit with Paysafecard. To be honest the rest of the site is so good that this is just about forgivable, but it’s still disappointing to see. On the plus side, withdrawals are processed quickly and there aren’t really any limits, while deposit limits vary from player to player. Although Mr Green hit the scene in 2008 it was officially founded in 2007, however, the casino’s story actually goes back further still. It was the brain child of three Swedish entrepreneurs; Fredrik Sidfalk, Henrik Bergquist and Mikael Pawlo; but Sidfalk and Bergquist had form in the area having founded Betsson way back in 2001 along with Anders Holmgren, who was arrested on suspicion of insider trading in 2018 – naughty naughty. To make things complicated (as these companies like to do) Mr Green actually has a parent company named Mr Green and Co AB, but Mr Green Ltd itself is the biggest of the group. Mr Green was something of a trend setter when it opened, being one of the first online casinos to offer games from different providers and creating a seamless wallet solution rendering the need to trade chips to play games from different vendors obsolete. They have carried on in the same vein and these days offer games from developers too numerous to count. A Sportsbook was added to the product list in 2016, and was improved upon greatly in 2017, coinciding with their becoming the official partner of Celtic Football Club as well as the head sponsor of the Professional Darts Corporation Players Championship Finals. 2017 was a big year for the casino all round, as it also saw the introduction of The Green Gaming Predictive Tool which the company developed to highlight risk behaviour and help players who develop dangerous habits or betting patterns. All of these commendable achievements haven’t gone unrecognised: not only are Mr Green a multi award winning casino, but they have won at least one award every single year since 2009. Now that is impressive by anyone’s standards. First of all, Mr Green should be applauded for their commitment to player safety. They state that they are a casino that puts the player first, as do many others, but unlike many others they really deliver the goods. Huge investments have been made to The Green Gaming Programme allowing players to set risk limits which are then monitored and adjusted accordingly by the casino. Their contact channels are openly available and easy to find which is always a good sign, and what’s more, the customer service team seemingly never sleeps; they are on hand 24/7 including on public holidays via Live Chat, E-mail or telephone if you prefer real human interaction. Their players really do seem to be at the heart of everything they do, and that is refreshing to see. All casino’s pay lip service to their customers, but here it is the real deal, and the reps we spoke to answered with humour and curtesy, which goes a long way. Live Chat – Hit the green speech bubble that is ever present at the bottom of the screen and you will be connected to a – probably quite witty – operator. Phone – +442035100870 is the number to call – you can even FaceTime! Note: not a freephone number. @mrgreencasino – It’s a token gesture really since updates are irregular at best. The Sportsbook account fares much better.